Jessica Devins and her husband have loved photo booths since their first date, so her husband suspected nothing unusual when she recently wanted to stop by a booth and take some funny pictures together. 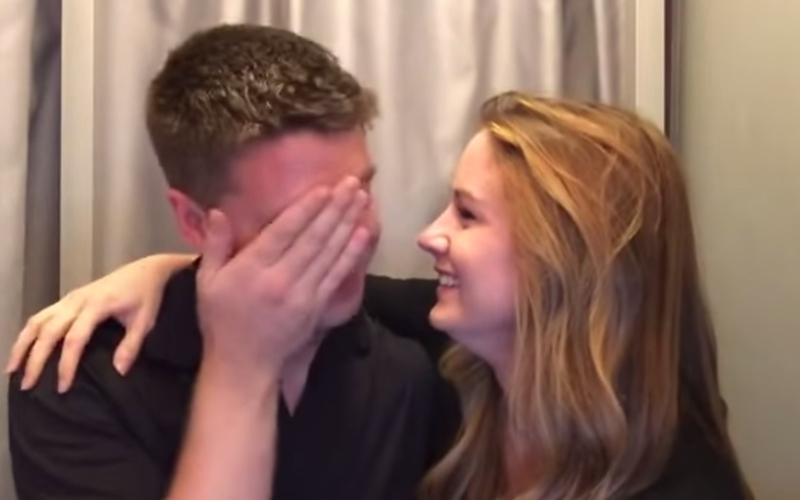 What Jessica’s husband wasn’t expecting was a surprise baby announcement. During the first photo, Jessica raised a tiny cap with the word “Baby” written on it at the last second, then turned and showed the cap to her husband. His reaction was absolutely priceless. Jessica uploaded an iPhone recording of the announcement to her YouTube account on Christmas Eve, and it quickly went viral—already garnering over 3 million views. “For those who have been asking, I actually started taping my iPhone to the front wall of photo booths to capture video of our silly faces a few months ago. That way he wouldn’t be suspicious when I was finally able to share the happy news,” she wrote in the video description. After receiving hundreds of congratulatory comments on the video, Jessica posted a thankful response on Jan. 3rd.